You joined the Foundation Board in the organization’s second wave, after it had gotten its footing a bit. What was the regional atmosphere when you joined? Of the Board? Board members were all selected at that time because they were very active in their communities. 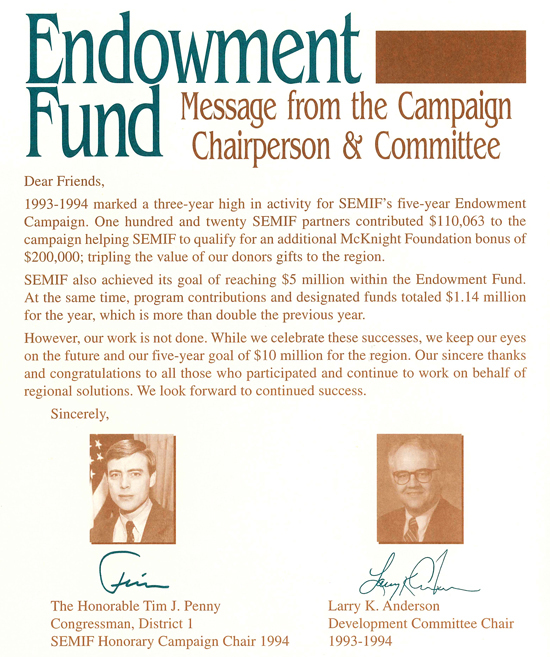 We didn’t talk about endowment much, or fundraising, but it was during that period that we put together our first campaign to raise money, and Tim Penny was the chairman of that committee (General Endowment Fund, 1991). That was a big deal, getting someone of his stature to be a volunteer chair of that fundraising campaign. At that time, the board was very active in the lending process. They would approve every loan every month and go on site visits. That took several years to get to how effective it is today. Why do you feel creating that sense of regionalism was so important? I think there was such a great hope that people would recognize regional assets even in they weren’t in the bounds of their own community. When you look at the 20 county area and the drivers you have – in medicine through Mayo, in research through the Hormel Institute, the strong agricultural economy we have – it just seems like if you put all that together in one big community, the growth potential was so much stronger than it would be for any one small community. We had to be together to get critical mass. Small towns don’t have critical mass by themselves. Biggest moments of encouragement? Sources of inspiration? When the organization really developed creditability, and it took a number of years to get that credibility. I think the first obvious marker of that credibility is when we started getting some financial support from outside just Owatonna. The financial support was the first strong indication people were taking it seriously. At the early stages, what did you think the Foundation would be now? What was your vision and mission for the future of the organization? Some of us saw it as a big, powerful economic development organization that was really going to change economic development in southern Minnesota. 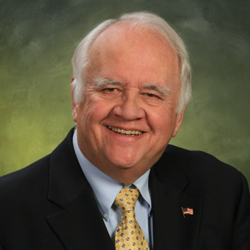 Most of the people on the early Boards were economic development people. It wasn’t a futuristic organization at that time. It was building – we were learning as we went. The focus areas have changed over time, but they have to change to meet the shifting needs of the region. It can have the same mission, but not the same practices as it always had. Can you give an example of something really unique that the organization accomplished while you were there that had a lasting impact? The creation of the development operation. In the first several years, so much of the focus was on creating the internal structure, and while I was there, we were able to focus more on outside fundraising and things like that. Setting up the endowment funds, such as the one Tim came on board to help raise money for, was pretty important. The fact that the Foundation serves a multi-community region is really unique. Most foundations involved in economic development are not. The strength of the Foundation is its connection to the communities. If we hadn’t had that connection, I don’t think we would have been successful. They’ve done a good job in keeping that connection. That was a concern I had was how do we keep that connection? We don’t want to get so focused on what we’re doing that we lose touch with the communities. The diversity that we have. Agriculture is the backbone of Minnesota everywhere, but we also have Mayo and Hormel Institute, good education, and some natural assets. The growth of the Destination Medical Center is going to affect a lot more than Rochester – that’s going to reach out. What could be better for an ag area than that type of diversification? The communities are really looking forward to the changes and opportunities. You can’t just be waiting for 1950 to come anymore. I don’t think there are many rural regions in the country that have the assets that this region does. What are your favorite things about living here? The people. We have a lot of really good friends and that’s where I want to live. We’d lived in St. Paul when we were first married. It was fine, but it wasn’t where we wanted to stay or raise a family. My grandchildren are the 6th generation in the same house, so we have deep roots in the community. I really see these small towns as jewels. They have to work together and think about the future, not the past. What do you see as critical next steps for smaller, Midwest communities to remain not only viable places to live, but vibrant communities that attract newcomers? What do you like about living in a community like Frost? Their only hope is to be working together - one of my enduring mottos is "good things happen when people work together." They can’t be independent economies anymore. I’m not sure they ever really could. We have to work together. The biggest complaint among young people is there’s nothing to do, so we have to make sure that there are things to do. Not necessarily everything in each town, but regionally. I hate boundaries. Boundaries have been one of the worst things that ever happened to us. They’ve kept us small. The purpose that the town was created to serve – fueling the train – doesn’t exist anymore. What is the purpose today? Some do a good job of finding out and making it work, and others are just waiting for 1950 to come back.